The front porch is finished.� I wanted to show you the finished product.� I’m not sure the picture does a good job of showing it or not. 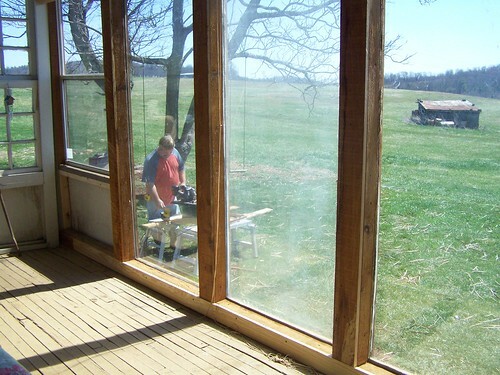 I rolled the blinds down some so you all could see them too.� When we do school out here, we roll them down some to eliminate the glare.� They also help keep it cooler in the summer.� We now have cleaned and mopped the floor and returned all the furniture to the porch.� It is so nice.� Thanks, Hubby. It looks wonderful. I like the blinds that you have. We keep the blinds closed when doing school as well because of the glare. So glad things went well for Jessica’s appointment. I pray for her and the little one when the Lord brings her to my mind. You all will have so much fun with a new little one right before the holidays! I love it! 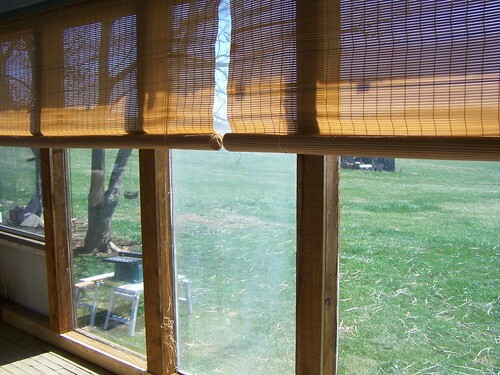 Our porch is only screened but we have those same kind of blinds too. I love them as they help keep the porch cooler and give some privacy as well. I know you are so glad to have it all done 🙂 Hope you have a great time at your visit. I was saying that I love a porch in rainy weather and that your cinnamon buns sound lovely..
Perhaps you will share your recipe..